As someone who was born after many of the events depicted occurred, Straight Outta Compton served as a sort of history lesson tied in with the hip-hop revolution that went on during the time. While I’ve heard the music and know who these individuals are, specifically Ice Cube and Dr. Dre, I still had about as much knowledge about the Compton based hip-hop group as I did about nuclear physics. But even with that lack of information going in, I was able to enjoy these true-life characters based on the superb acting and wonderful direction of F. Gary Gray. Following the birth, rise, and eventual fall of the hip-hop group N.W.A., Straight Outta Compton is the story of what happened to create the iconic group. Eric ‘Eazy E’ Wright (Jason Mitchell) is a neighborhood drug dealer who is starting to realize his getting caught is almost inevitable. That is until he jumps on to help fund a record label, Ruthless Records, with aspiring DJ Andre ‘Dr. Dre, Young (Corey Hawkins) and lyricist O’Shea ‘Ice Cube’ Jackson (O’Shea JacksonJr.). The three, joined by Antoine ‘DJ Yella’ Carraby (Neil Brown Jr.) and Lorenzo ‘MC Ren’ Patterson (Aldis Hodge), hit it big with the first track ‘Boyz-n-the-Hood’ and immediately take off to change music forever. 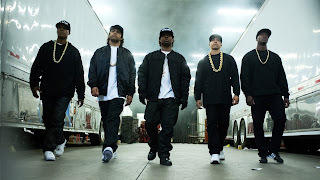 From the start it’s clear, while the story overall is about N.W.A., the main characters are clearly Ice Cube, Dr. Dre, and Eazy E. They have the most screen time and largely the bigger story and character arcs. All of these individuals are introduced in a very well paced and organic way. The music may be phenomenal and what put these guys on the map, but the characters are what sets Straight Outta Compton above other music biopics. The performances are all pretty fantastic. 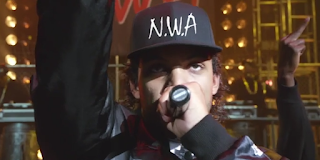 O’Shea Jackson Jr. nails his role which, although strange, shouldn’t be too hard as his character is his own father. But nonetheless, Jackson brings all of the Ice Cube-isms with him and clearly has an understanding of what went on at the time. Corey Hawkins is again solid as Dr. Dre, bringing the emotions and enough confidence with him to really hammer the role of producer. By far the stand out however, is Jason Mitchell as Eazy E. In many ways, Eric Wright is the main character of the three. The film opens with him and ends with him and everything that happens in between is performed with such a emotional weight that you can’t help but sympathize with him despite some poor decisions along the way. The direction by F. Gary Gray is wonderful as stated before. He gets great performances out of all involved and paces everything quite well for the first two-thirds. The only negatives I could detail would be that the last thirds becomes a little too choppy, changing from scene to scene a little too quickly. Then of course one has to acknowledge that the film seems to gloss over some more negative aspects of these individuals lives, however that’s sort of expected when two of them are the film’s producers. So what did you think of Straight Outta Compton? Have you seen it, are you interested in seeing it, or have you no interest in it at all? Sound off below with your comments or feedback and remember to come back for weekly reviews.